SAMUEL CARABALLO was born in Vieques, a gorgeous, tiny island off the East Coast of Puerto Rico. He spent many of his childhood days playing in the countryside hills and picking mango and guavas, his favorite tropical fruits. He has served as an interpreter for the courts in cases involving Hispanics and has also dedicated many years to teaching Spanish in several public schools in the United States. He is the author of four bilingual picture books for children, Estrellita se despide de su isla / Estrellita Says Good-bye to Her Island (Piñata Books, 2002), Mis abuelos y yo / My Grandparents and I (Piñata Books, 2004), My Big Sister / Mi hermana mayor (Piñata Books, 2012), and Estas Manos: Manitas de mi familia / These Hands: My Family’s Hands (Piñata Books, 2014). He lives in Virginia with his family. SHAWN COSTELLO graduated from the Maryland Institute of Art with a BFA and received her Master’s Degree in Art Education from Towson University near Baltimore. She teaches art in Howard County, Maryland. 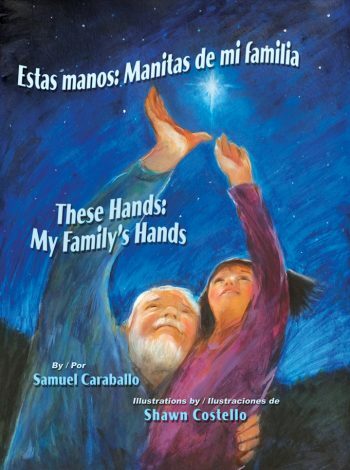 Her work has appeared in Cricket and Spider magazines, and her illustrated books include Estas Manos: Manitas de mi familia / These Hands: My Family’s Hands (Piñata Books, 2014), Private Joel and the Sewell Mountain Seder (Kar-Ben Pub, 2008), A Bus of Our Own (Albert Whitman & Company, 2001), and Mommy Far, Mommy Near (Albert Whitman & Company, 2000). She lives and paints in Maryland and Downeast Maine..